A little dwelling sits precariously on a lumpy red substances. Perhaps the red is the blood of family and ancestors all swirling around but simultaneously making your base. Biology forming you as an individual with various inherited traits. A wild ride sometimes but family is family. Or does this home sit on waves of flowing magma. Not the best place to build a home but this is exactly what every home is built on all across Earth. Tectonic plates constantly moving and below that level we are all sitting on a very hot core. A slightly paranoid idea or a reality check? All these thoughts plant family trees deep into geology and acknowledge the precious but fleeting concept of home. When not busy with the show we managed to stroll about Fremantle and a few other Perth suburbs as well and we did the classic bicycle trip around the charming Rottnest Island just off the coast. 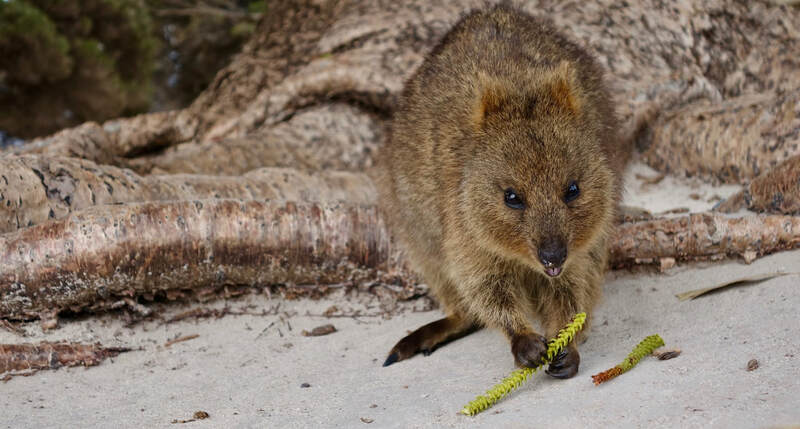 The little Quokkas nibbling on fresh local pine shoots entertained us as did W.A wine. We also got to meet many fabulous artists living in Perth during the month of August. A short essay from a self initiated maritime residency. On a large cargo ship I observed a set of small maritime signal flags, used for visual communication across long distances. They say something in a coded manner, a bit like art in some ways. I’ve always been fond of flags but never fond of that nasty, nationalistic excitement often found fermenting and scurrying in circles beneath flagpoles. That “us vs them” attitude is a bit dangerous and dated, so let us avoid fluttering that topic. Flags all over the world are symbols used to communicate, separate and bond, but I saw these little fabric signals as inspiration for the creation of a series of artworks. Art that I make in cabin 705 On deck F of the CMA CGM ROSSINI. 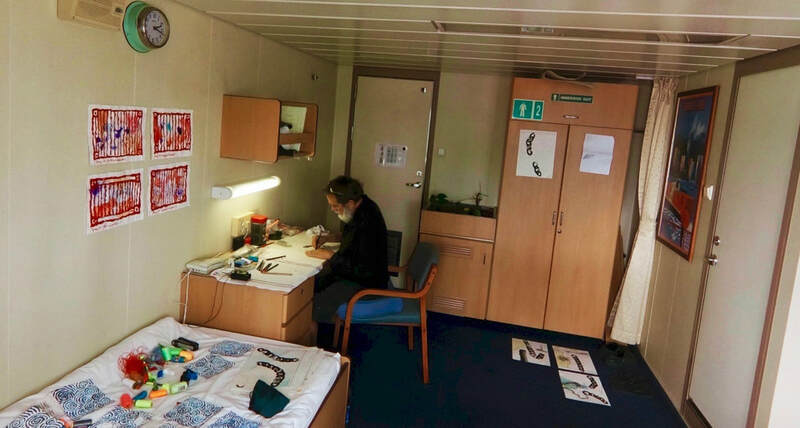 It is not new to find artists making art on-board ships. In the busy colonisation period of human history - the early globalisation period, if you like - artists were employed to sketch coastlines and draw everything they encountered, from icebergs to exotic fern fronds, often from the decks of tiny wooden boats. 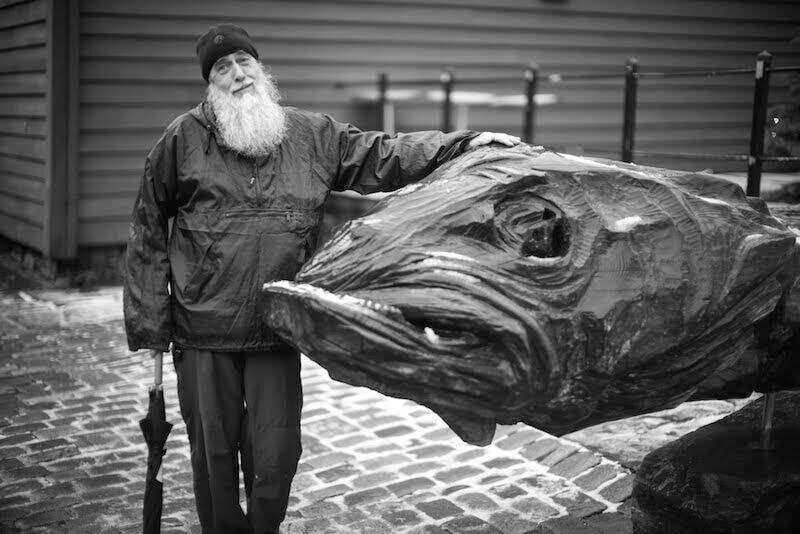 Once photography appeared on the scene this documentation job for artists became obsolete, but now there seems to be a resurgence of artists who find themselves creating art at sea, in all forms and for all sorts of reasons. This cargo container ship is one of a few hundred owned by a large French company. The Rossini is 277 metres long and has a beam (width) of 40 metres. Built in 2004, it has a gross tonnage of 65,730 tons. There are 4,450 (20 foot long) cargo containers or “boxes” full of goods, all securely stacked outside my porthole. Amazingly most items purchased in shops across the world have been on cargo ships just like the Rossini. I am accompanied on this voyage by documentary filmmaker Malcolm McKinnon, a New Zealand passenger on an overland trip from Australia to the UK and the ships crew of 29, comprising French, Filipino and Indian officers and sailors. Some of the crew have an interest in what I make onboard but this is a working ship and time is money. The life of a sailor is not as it was and there is no time to carve intricate exotic scenes on whale teeth anymore. Limited time is spent in ports due to containerisation and robotic machines so that wild sailor shenanigans infamous in ports across the world has all but disappeared. Spare time onboard is spent watching DVDs, working out in the gym and relaxing with the odd celebration. My project slowly paddles forward as I watch, paint, photograph, scumble, glue, sew and somehow connect all my on-board experiences. I draw a set of cargo containers and title them with archaic foul language used by sailors of the past. A BOX OF BESPAWLERS, A BOX OF STAMPCRABS and A BOX OF FUSTY LUGGERS. The terms are mysterious today as are the contents of each cargo container. The crew does know if the goods are toxic, explosive or require refrigeration but not much more. A second series of work on paper deals with flags. I paint and glue a set of fictional flags on damaged paper each titled with a fictional country - THE REPUBLIC OF EXCLUSION and THE KINGDOM OF DOUBT. I flag the idea that nations are constructions, never permanent and a bit over-rated from my perspective. They require continuous mild propaganda, myths, symbols, stories and forgetfulness. History does its best to keep facts alive but nation building is powerful and seductive. We cruise over the sea at an averages speed of 16 knots (approx. 30 kilometres an hour) as I watch the many shades of aquatic blue beneath a very large sky. Since leaving the Port of Fremantle some days ago we have steamed northbound over the Indian Ocean, passing close to Christmas Island, slipping between Java and Sumatra, northwards then westward across the southern zone of the South China Sea to Singapore. Finally, we’ll traverse the Strait of Malacca and dock at the port of Kelang in Malaysia where Malcolm and I shall disembark. That is a distance of 2900 nautical miles or 5365 kilometres as the albatross flies. I first became aware of oceanic art residencies involving long sea voyages in 1989 via the Australian Antarctic Division. I eventually undertook a resupply voyage in the summer of 2000-2001 to Casey Station as part of the Australian Antarctic Arts Fellowship program. 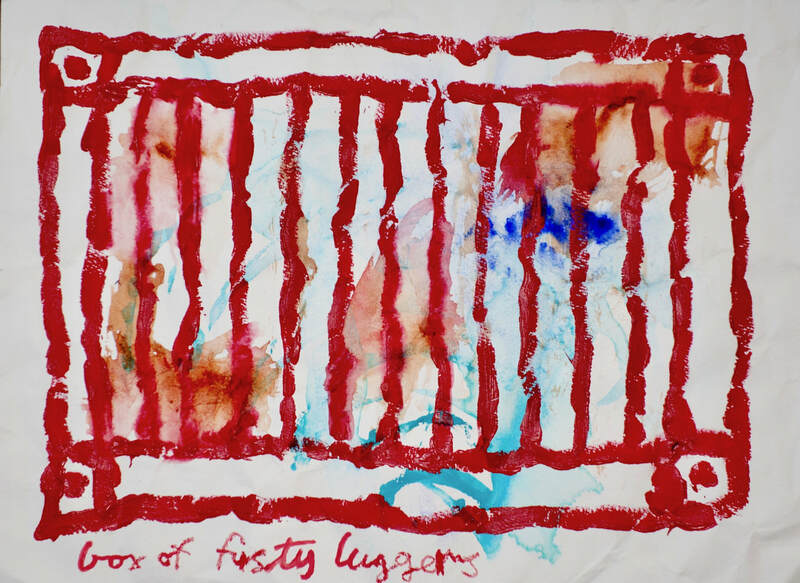 My residency involved a sea voyage of three weeks duration that was enormously influential to me; since that trip almost seventeen years ago I have operated as an artist on eleven separate voyages, all within Polar regions. I guess that makes me an “old-hand” at this kind of artful, sea-dog endeavour. 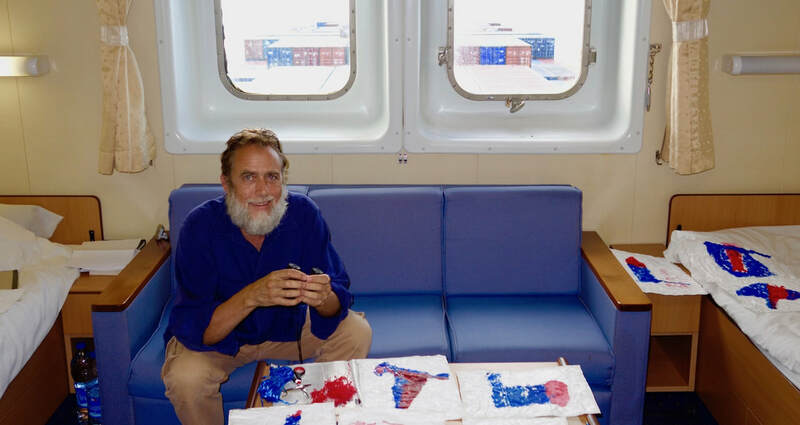 Over the past few years a number of other specialised maritime artist-in-residence programs have been set up on cargo container ships, research vessels, private yachts, house-boats and tourist ships. Like all art residencies the interest is high due to the enormous amount of inquisitive and mobile artists across the planet. 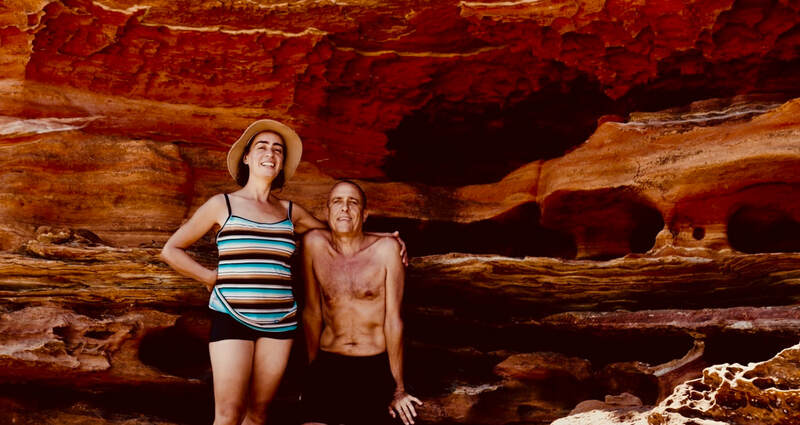 This interest to engage with waterways is not surprising as the world is mostly covered by water and all humans have an emotive and biological connection. Did not our ancestor’s way back in the good old days live underwater? Personally, the size, the beauty and the lack of law are the main elements that intrigue me about the sea. I also like to watch oceans move. In times of doldrums when that big wet expanse is dead calm but twinkling with sun-rays, or even during a ferocious storm when eighteen meter (60 foot) high waves threatened the ship I was on-board. The sea is always entrancing. Everyone is intimately aware of the magnificent scale of the sea; its force and its impact. Regarding the law of the seas, well, that’s a bit hazier and a lot more fluid. Here I sit today on a Saturday morning in 2018 watching tropical currents flow and hundreds of cargo ships waiting to dock. I am in the international waters just off the east coast of Singapore where in February 1603 the Dutch VOC (Dutch East India Company) captured Santa Catarina: a Portuguese cargo ship full of exotic Chinese porcelain and valuable musk. This event was the catalyst for a young Dutch lawyer by the name of Hugo de Groot being called upon to draft a defence for such a colossal seizure of loot. In Hugo de Groots maritime thesis he states that all nations should be able to use international waters freely for seafaring trade. This document mentions characters like God and is written for “Princes and free states of the Christian world”. It was hardly international in its structure, but it was a beginning and subsequently this thesis titled Mare Liberum became the foundation for global international maritime law. Today oceans outside of national coastal or continental shelf areas are seen as free zones that nobody can own. (Antarctica has similar status under the terms of the Antarctic treaty.) This concept of Mare Liberum or The Free Sea is upheld by the U.N. Convention on the Law of the Sea (UNCLOS); an international agreement currently signed by about 160 nations. I see it as a very complicated set of rules that are impossible to enforce, but it’s the best we have to date. We really need much greater control as to what is actually happening at sea in terms of over-fishing, mining, pirate activity, illegal transportation, future nationalistic claims and pollution. In a nut shell or should I say, in a seashell - 7.6 billion humans make too much mess at sea as well as on land. In my body, which is notably 60% water, I have Dutch sailor genes inherited from my biological father who comes from a long line of merchant sailors, whalers and tug boat owners. Quite possibly one of my seafaring ancestors in the Netherlands, while on leave from a whaling vessel or hoping for a berth on a ship preparing to set sail to the Far East, drank a beer or an Oude Genever (Dutch Gin) in the same café where Mr Hugo de Groot formulated his thoughts on the faraway S.E Asian maritime trade problems. My interest in the sea could actually be pre-me as I may have been born pre-programmed with a set of sea legs. 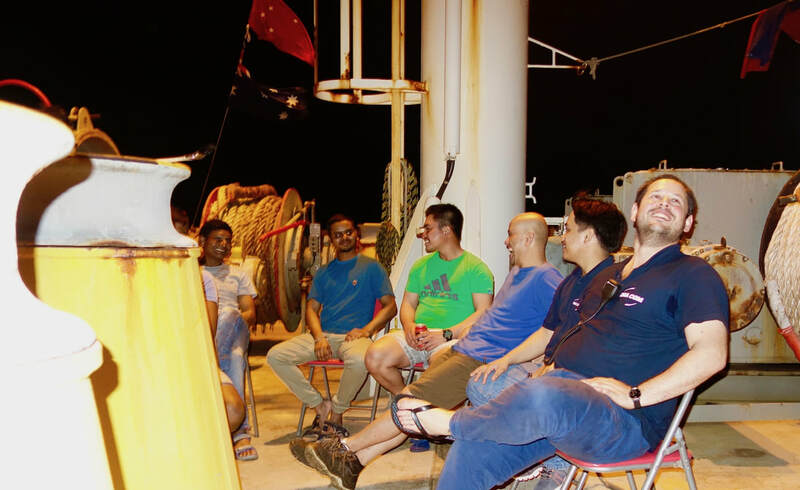 The equatorial sea is vastly different compared to the waters I have crunched through on icebreakers during previous art residencies on-board Polar vessels, but I am still in international waters or the free sea. I open my porthole and let the warm tropical air enter my cabin, while tiny streams of salty body sweat attempt to cool me down. I float on the salty water called the Ocean which is approximately 1.332 billion cubic kilometres larger than I am. Being a minuscule and not that very important human I scan with my little binoculars the infinite blue, the busy port activity and I ponder the sublime. It is easy to be mesmerised and belittled by the awesome sea and mesmerised I am. Artists are sometimes good at seeing the big picture and then presenting their version to others via innumerable styles; some let their emotions run amuck with wild colour and evident passion, while others use direct logical data, manifest in neat mechanical formats. All are merely personal methods of dispatch. Artists at sea can help raise warning flags and inform landlubbers that the sea is a bit sea sick. But here in the Strait of Malacca today it all seems relatively clean and safe, so I won’t need a sword, a solicitor or a sonic stun-grenade just yet. All I require is a tube of sunscreen lotion and another tube of aqua watercolour paint. It is not surprising that I am attracted to the language of the International Code of Signals: a simple graphic, colourful, abstract form of flag communication. When newer technologies are on holiday and one ship wishes to talk to another these small nautical flags can represent and convey most things. All you need to do is wave these flags about in the right order and hope that the other ship can see you and understand what you are on about. Which, in my experience, is very much like making art. 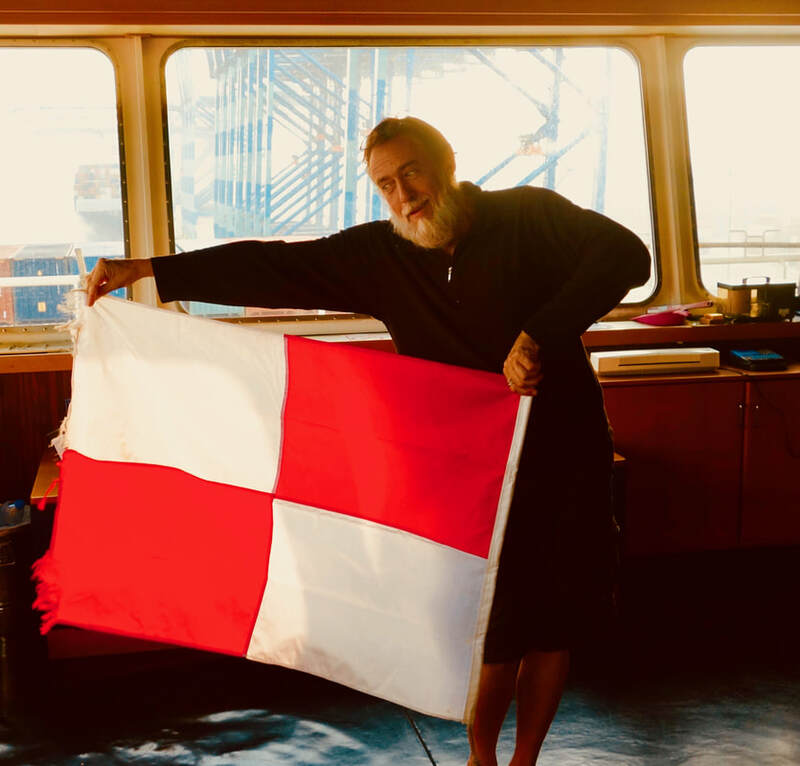 Any sailor or Vexillophile will decipher the red and white maritime signal flag as representing the letter U but also if flown alone it will mean – YOU ARE HEADING INTO DANGER. I sometimes fear that we may be.